Kverneland 97150 C с рабочей шириной 15,00 м, является машиной, предназначенной для высокой производительности. Это тяжелые грабли с очень большой мощностью и регулируемой рабочей шириной, которую можно изменять даже во время работы. Четыре ротора с 15 граблинами обеспечивают идеальную производительность сгребания. Ширина захвата 15.00 м позволяет сгребать большее количество травы. Редуктор, находящийся в масляной ванне, ProLine. Гидравлическое регулирование ширины захвата в диапазоне от 9.80 до 15.00м. Гидравлическая регулировка высоты роторов граблей. Активный руль оси для отличной маневренности. Продуманный складной механизм, что позволяет граблям быть ниже 4,00м без снятия граблин. Raking width can be continuously varied on the move between 9.50m and 15.00m. Raking width can be matched to the density of crop to obtain an evenly shaped and equally wide swath over the full length. The two outer rotors can be adjusted individually. You can independently steer an outside rotor around an obstacle such as a pole or tree without having to change travel direction with the complete machine. The 2-pt headstock allows a turning angle up to 80° and the steered wheel axles ensure the 97150 C has unequalled manoeuvrability. Despite a total length of 9 m, even narrow gateways or approach lanes to fields are easily negotiated. Hydraulic or pneumatic breaks allow 97150 C to reach high transport speeds, minimizing time spent going from field to field. During transport the height of the machines is below 4m, without removing the tines. Transport width with detached tine arms is only 3.45m. Conversion from transport to working position is very fast, and is carried out from the tractor cab. Hydraulic ground pressure control means constant and adjustable pressure on the rotors regardless of their position on the carrier frame. Free mobililty in three planes combined with six steered twin wheels per rotor give each rake head perfect ground following ability for the cleanest possible raking performance. Each rotor can be independently set for height by using the hydraulic system. GEORAKE optimises the raking result – every time and under all conditions. It provides less stress for the driver and supports him in doing an excellent job. 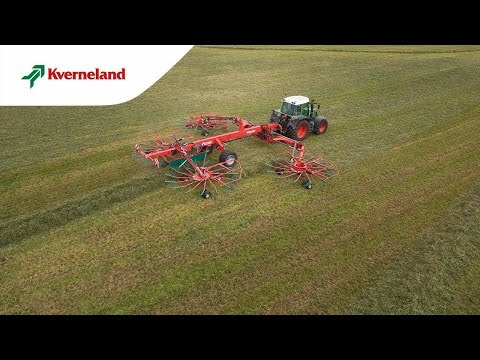 The Kverneland GEORAKE solution is the answer when it comes to managing raking operations in the most efficient and productive way. Making accurate, well-shaped swaths has never been easier. GEORAKE automatically lifts and lowers each individual rotor at exactly the right time – all you need to do is to focus on running the tractor in the most efficient way. The stress factor of finishing swaths correctly, before turning on headlands, or in odd shaped plots, has been completely eliminated.